Overall the Lumix TZ100 reflects where compact cameras are headed: it’s all about larger sensors and more touch-based controls, which will become the norm in the near future - we said the very same of the Canon G9 X (although the Panasonic would be our preference if faced with the choice of buying between those two models) - but, right now, the lens is as much a limitation as the sensor is a liberation. The Panasonic Lumix TZ100 (known as ZS100 in the US) joins an increasing raft of cameras built around a 1-inch sensor size, promising upgraded image quality over what you would normally expect from a standard compact. Most prominent camera companies are playing the pocketable 1-inch sensor camera game right now: we've seen the likes of Sony with its RX100 series, Canon with its PowerShot G5 X, and new to the stable is Nikon with its trio of DL models. But the TZ100 takes a different angle thanks to its 10x optical zoom lens - it’s more the casual consumer snapper; a TZ80 on sensor steroids, if you will. Indeed, the TZ100 keeps very much within that "travel compact" camp in terms of physical size, avoiding enlarging both its scale and price by using a lens that, while fast at the wide-angle, doesn’t maintain that fast aperture throughout its extended zoom range. As such it should be seen as the evolution of technology trickling into more accessible products, not a ultra-high-end compact as per some of its peers. We’ve been using the TZ100 for a week to see whether that lens decision compromises what is otherwise a quality premium travel compact. Is it the 1-inch wonder to pocket? In its simple black finish the TZ100 doesn’t look particularly different or distinguished compared to many compact cameras. But we don’t have the simple black finish; nope, we have the gunmetal grey with flash red cut-out line surrounding the up-top on-body controls. It’s kind of kitsch, kind of cool, and certainly stand-out. Not that we suspect many will buy this flashier looking trim model. Anyway, we digress. The point really being that Panasonic has maintained discretion: the TZ100 remains pocketable - it’s 44.3mm thick - despite its 10x optical zoom and large sensor size. That ensures it's still very much a compact, not a chunkier wedge like, say, the Canon G5 X. 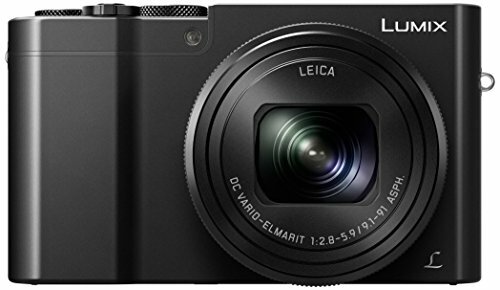 However, the Panasonic is larger than any Sony RX100 model, thus sitting it somewhere in the middle of its main competition. That’s an interesting position to be in as a new breed, but a slightly confusing one because most 1-inch sensor cameras pair the highest ability with the sensor. Although it’s got the "TZ" name, we feel as though the TZ100 ought to be the current TZ80 model in a sense, rather than its bigger-sensor brother. Without the lens ability to keep up with its near competitors, there’s an immediate lacking in this Panasonic’s ability, which is the same issue we found with the also slender but all-touchscreen Canon PowerShot G9 X. The lens is a critical part of the TZ100’s make-up. With a 25-250mm f/2.8-5.9 (equivalent) on offer in this Lumix, the extended zoom isn't particularly well designed for a number of scenarios. As the maximum available aperture dips as the zoom extends, so therefore does the ability to allow lots of light in, which has a knock-on effect to maximum shutter speed availability, ISO sensitivity required to expose and, therefore, overall image quality as a result. If you’re interested in the maximum aperture at standard focal lengths then here’s what you’ll get: f/4.1 at 50mm; f/4.6 at 75mm; f/5.2 at 100mm; f/5.8 at 150mm; and f/5.9 at anything beyond 157mm. Indeed we’ve found the camera will often plump for higher ISO settings than you might otherwise want to use. Even when shooting outside in daylight at the full 250mm (equivalent) extension auto-selecting ISO 640 isn’t unusual; indoors in daylight and ISO 1600 has frequently been the choice - which is the soft default ceiling to Auto ISO, and often not paired with a sufficient shutter speed to match. The ISO sensitivity can be pushed higher manually, but in ISO Auto the camera is fairly reluctant - a 1/4 second exposure considered ISO 1600 to be sufficient, for example, when that shutter speed is clearly too slow. On the upside this lens does incorporate optical image stabilisation to help keep things steady, which goes some way to negating that limited maximum aperture. When the camera thinks the shutter speed is a little too low you’ll be presented with a red "shaky camera" symbol in the display. It’s decent stabilisation that you’ll feel and see in action, given the way it smoothes out movements. So that's the compromise with the TZ100: you'll get more zoom than any other pocketable 1-inch model, but it's not an especially proficient zoom. It feels akin to the first-generation Sony RX100 in a way, which over its successive releases has cut back on the zoom in favour of a wider aperture lens and pop-up electronic viewfinder - but that also escalated its cost (to over £800), which is one way the £529 TZ100 claws back some points. In use the TZ100 performs well, though, much like the TZ80 with some added in that respect. So while shooting in low-light conditions might prove tricky to get a steady hand-held shot - and the screen preview does stutter somewhat due to lower frame-rate on account of light limitations (it can’t always achieve its maximum 60fps) - it doesn’t cause major issues with the TZ100’s rather accomplished autofocus system. The camera seems adept at locking onto subjects and confirming focus in a variety of situations, as it’s functional to -4EV, which makes it particularly snappy at the widest-angle settings. We’ve stuck with the 1-area autofocus option for the majority of this test, as is typical of our Panasonic camera setup, with the ability to reposition it across the touchscreen via a quick tap is great. The top thumbwheel can be used to the resize this point through eight different sizes from small to large too. In the TZ100 there’s also the inclusion of Pinpoint autofocus, a setting that’s typically reserved for the interchangeable lens Lumix line-up. We’re especially fond of this AF option, which only Panasonic offers: it displays a cross-hair target, which then magnifies the in-focus area to 100 per cent scale in a small on-screen window to confirm precision focus. It’s not as immediate as the 1-point AF option, but it’s great for assuring, well, pinpoint accuracy - we see where the name came from. There is also a 49-area auto mode, which is fine, but this decides the subject and area of interest for you - which you may or may not want as the focal point. Choose Custom Multi instead and a 13-point diamond arrangement can be positioned across the 49-point grid, which is a nice touch. Face detection and Tracking options are also fine enough, but the tracking mode isn’t especially speedy at keeping up with moving subjects (single/continuous autofocus is actually a separate option, but tracking will always work on a continuous principle). Close-up focus needs to be manually engaged (when in a manual shooting mode) by hitting the left d-pad direction and toggling between standard AF and AF Macro, the latter allowing for 0.05cm close-up focus at the 25mm equivalent. That drops to 20cm at the 100mm equivalent, 50cm by the 150mm equivalent, at 70cm from 188mm and beyond. Still not bad, though, and we’ve been able to shoot some shallow depth of field "macro" shots with the zoom fully extended. In terms of features the TZ100 (ZS100) is typical of Panasonic's current TZ line-up. That trim body incorporates a built-in electronic viewfinder, tucked to the top left corner. It's a subtle incorporation, and while the panel isn't super-high resolution - it's the same 0.2-inch 1,166k-dot panel as found in the TZ80 - it's a useful addition. Even if you don’t use it often, it’s tucked out of the way sufficiently and can even be deactivated using the Fn4/LVF button next to it if you want to prevent auto eye-level disruptions. The main LCD screen on the back of the camera is fixed to the body, rather than mounted on a vari-angle bracket, which is a feature we’ve got so used to in other cameras that we rather missed it in the TZ100. Its inclusion would bulk-out the camera, we suppose, so can see why it’s absent. But it’s still on our wish list. Other features include a lens control ring to the front, which glides smoothly upon rotation - no click-stop motion available here (and such dual functionality would have been great, alas) - for quick adjustment of priority controls, such as aperture value. There's a second rotational dial to the rear top that can also do the job. There are four function (Fn) buttons arranged across the rear of the TZ100, although they’re pre-defined for this camera: Fn4 looks after finder/LCD activation; Fn3 brings up the Quick Menu (which can be touch-controlled and even customised with available settings); while Fn 2 and Fn1 handle what’s known as Post Focus and 4K Photo. Those last two are Panasonic’s attempt to further stand out from the crowd. The 4K Photo modes - available on a quick access function button - allow for a rapid burst of shots (extracted from a movie file, essentially), the best of which can be selected as an individual 8-megapixel frame after shooting. It's even possible to shoot a single second's worth of footage before even firing the shutter to help catch that perfect moment. It’s very clever, but we’re unconvinced by the 4K Photo namesake and whether people will immediately get this mode. One additional take-away, of course, is that the TZ100 can capture 4K video too. The newer mode of the two, Post Focus, does what it says on the tin: you can focus the shot after taking it. However, if you're hoping to shoot hand-held like you would with a Lytro, then you'll be disappointed; the Panasonic mode needs a tripod for steadying the frame while it grabs a movie file at multiple focal depths. It's a nice idea though, even if it's not immediately apparent how it functions after clicking the dedicated Fn2 button - it's as though there needs to be more education there rather than just being thrown into the deep end and thinking "what does this do?". As with any camera worth its salt, a significant reason to buy a compact rather than just using a smartphone comes down to the resulting image quality. The TZ100 certainly steps up beyond a standard compact camera in this department, but as we touched upon the ISO sensitivity is frequently pushed high as a result of that lens. However, even through to ISO 1600 that’s not a massive issue. A shot of a statue, painted in mid-grey, reveals only slight colour noise in the deeper areas, but the image processing otherwise smoothes everything out without entirely losing detail - sure, there could be some more precision in the eyelashes in this example, but they’ve not been entirely muted. Given the sensor’s 1-inch scale, the 20-megapixels arranged over its surface are each roughly two and a half times larger than the TZ80 model. So even at this high resolution the light gathering properties are sufficient for a solid signal and decent results. The same ISO 1600 shot on the TZ80 would be nowhere nearly as clean, which is what you’re paying for in the TZ100. And if there’s enough light to keep the sensitivity low then the results are decent. At ISO 125, shots of brightly coloured flowers taken in the Portuguese sun show crisp detail. However there is some "mottling" to larger areas, while edges could be more defined - something that even more apparent in, say, an ISO 640 shot of an olive hanging from a branch. The other obvious benefit of a 1-inch sensor is the associated depth of field, meaning a more shallow, softly blurred background than a smaller sensor would be able to produce (at the same equivalent settings). Want that melty backdrop? The TZ100 should do a much better job than a smaller compact - and even f/5.9 at the full zoom extension gives a good lick of background softness. It’s a good look. It's hard not to come full circle to the comment about the lens though: with the maximum aperture dipping to just f/5.9 at the 250mm equivalent focal length there's a lot less light available to use, which pushes the ISO sensitivity up. And while manual shots of a stuffed toy lion taken at ISO 6400 are fine, this sensitivity shows a lack of biting sharpness, while image noise is more apparent throughout. It’s not to the point of oblivion, though, again the sensor size showing its strengths. In a sense the TZ100’s maximum aperture lens limitations are, in part, counteracted by its 1-inch sensor quality - finding a happy medium somewhere in the middle. And yet that leaves this camera feeling like a "TZ80 Plus" in a sense (minus the 30x zoom, of course), less the kind of high-end high-flier associated with most 1-inch sensor compact cameras. That’s the TZ100 in a nutshell really: it’s no Sony RX100 IV, but then it is more affordable than that and has a more significant maximum zoom to reflect its different market position; it’s a new breed with some commendable new ideas. We certainly can’t call it out on autofocus ability or overall feature set, but that lens is going to divide whether it’s the pocketable model for you or not.